Alli is all the rage these uk venlafaxine days.. It is compact in size, light in weight & easy to carry around. This Microscope permits examination on the desk & also on the post examination of an object in original size & shape in factories, laboratories & pipelines. The Microscope unit is fitted with an incident light through epi-illuminator, slot for dropping filters, supplied with a variable light control transformer 6V-20W. Two filters in mount, vinyl cover & following optical combination in box. Objectives : M5x, M10x, M20x & M40x. Stage Detachable Mechanical Stage for X-Y movement of specimens. Illumination Brightfield vertical illuminator 6V-20W Halogen with aperture diaphragm, filter slots and bulb centring mechanism. Supplied with a variable controlled transformer. Objectives Achromatic : M10X & M40X. Body Binocular Head inclined at 45-degrees. Nosepiece Quadruple revolving nosepiece with accurate centering and positive click stops. Stage Large Low co-axial Mechanical Stage for X-Y movement of specimens upto thickness of 65 mm. Illumination Brightfield vertical illuminator 6V-20W Halogen with aperture diaphragm, filter slots and bulb centring mechanism. Objectives Achromatic M4X – M10X & M40X. Model AMM-7 Same as Model AMM-7B, but with Monocular observation head. Body Trinocular Head inclined at 45-degrees. Eyepieces H6X – WF10X (paired) and P7X for microphotography. Model AMM-7 Same as Model AMM-7T, but with Monocular observation head. Model AMM-7B Same as Model AMM-7T, but with Binocular observation head. Focussing Quadruple revolving nosepiece with accurate centering & positive click stops. Nosepiece P5X, P10X and P45X SL. Illumination Brightfield vertical illuminator 6V-20W Halogen with field & aperture diaphragm, filter slots and bulb centring mechanism. Objectives Achromatic DIN M4X-M10X & M40X. Eyepieces H6X-WF10X (paired) and P7 for microphotography. Observation Head Binocular Observation Head inclined at 45-degrees. Magnification Provide magnification from 100x to 600x. Objectives M4X, M10X, M20X and M40X specially corrected for flatfield achromat. Eyepieces WF 10X and H5X. Model AMM-55 Same specification as per AMM-55B but with monocular head. Model AMM-55T Same specification as per AMM-55B but with Trinocular head. Model IM-1 Heavy base with coaxial mechanical stage for x-y movement, suitable for above models. Nosepiece Quadruple revolving Nosepiece with accurate centring and positive click stops. Stage Large sturdy coaxial arrangement for x-y movement. Objectives Corrected flat field achromats M4X-M10X & M40X SL. Eyepieces Wide field 10X and H15X (paired). Model AMM-77B All specification same as per AMM-77, but fitted with Camera Port on the side of Microscope base for Microphotography Equipment and CCTV. Observation Head Siedentopf Binocular observation head with adjustable eye piece separation. Stand Inverted microscope stand, complete with built-in transformer, calibrated light intensity control, socket and fuse holder. Stage Graduated mechanical stage, 150x160mm in size, offers 30x30mm cross section motion reading to 0.1mm by vernier. Provided with low coaxial controls. Objectives M5x (N.A.0.12), M10x(N.A.0.25), M20x(N.A.0.40) and M40x(N.A.0.65). Eyepieces Wide field HKW 10x (offered in paired set). Magnification 50X-400X for visual observation, 20X-165X for 35mm photography and 50X-400X for polaroid photography. Accessories Stage clip, 3 stage insert plates (opening 15, 25 and graduated 25 phi-mm), green and blue filters, bulb cord, line cord & spare bulbs. Polarising Built-in rotatable analyser and lamp polariser filters are provided for dark field illumination. Observation Head Binocular observation head. Stage Extra large 150 x 160mm, offers 30x30mm cross motion provided with low drive co-axial control. Objectives Specially corrected flat field achromats M4X – M10X – M40X & M60X (dry). Eyepieces Wide field – WF10X, WF 15X and WF 20X. 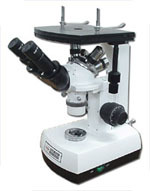 Model AMM-99A All specifications same as per Model AMM-99 but with Trinocular Head, suitable for Photomicrography. Objectives M5x-M10x, M20x and M50x. Eyepieces : WF 10x (Paired). Micrometer Eyepiece: Fitted with 10mm scale in 100 parts. Grain Size Eyepiece WF 10X: with 8 grain size rapid comparison of the microstructures. FILLAR Micrometer Eyepiece 10X: Direct reading to 0.001mm is accessible. Object Micrometer Slide: 10mm in 100 divisions, least count 0.1mm. Object Micrometer Slide: 1mm in 100 divisions, least count 0.01mm. Filters: Green, Yellow, Blue, Day light blue available in metal mount. Hand Press: Used to align the specimen surface parallel with the stage surface. Polarising Attachment for Metallurgical Microscopes.